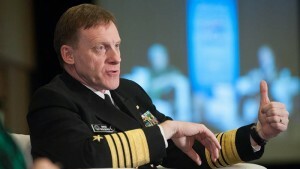 Rogers said that Cyber Command is made up of 80 percent military and 20 percent civilian personnel. It’s more difficult to recruit civilians, who are often offered higher pay at private technology companies. Close partnerships with private companies could increase Cyber Command’s employee recruitment. However, some private companies have rejected the idea of harnessing offensive cyber capabilities, saying that their job is to protect consumers from cyberattacks rather than to retaliate. Brad Smith, Microsoft’s president and chief legal officer, said that the private technology sector should act as a neutral party in the event of state-sponsored cyberattacks, rather than taking sides according to home country. Jason “Jay” Healey, nonresident senior fellow for the Cyber Statecraft Initiative at the Atlantic Council, agreed with Microsoft by saying that the government should be helping companies prevent and recover from attacks. “The private sector should be the supported command, not the supporting command,” Healey said. Peter Singer, strategist and senior fellow at the New America Foundation, said that the U.S. could adopt practices by Estonia’s Cyber Defense League, which employs civilian volunteers with security clearances to find vulnerabilities and to help respond to cyberattacks. The Cyber Defense League is on call at the local, state, and Federal level. Rogers said that Cyber Command should be given a broader range of duties instead of only calling in the military unit when the mission is specific and highly controlled. Martin Libicki, adjunct management scientist at RAND, said that the rules regarding cyberattacks haven’t been fully defined enough to step up the use of cyber weapons. For example, the United States needs rules about when it’s necessary to retaliate after a cyberattack. “We have to understand the efficacy of offensive cyber forces,” Libicki said. Libicki said that the military’s cyber capabilities will deplete if the U.S. continuously sneaks up on its enemies to take down the opposition’s networks. Eventually, the U.S. will lose the element of surprise, which would make cyber methods less effective.